As the internet doesn’t seem to overflow with print reviews / settings for it yet I decided to post some words about it. It is always difficult to measure a soft material but using my caliber I measured the diameter to be 1.75mm as it is supposed to. The filament also seems to be nice and round. I ordered the “sapphire” version of the filament, and it has a nice (mat) blue color which turns glossy when printed. It is also slightly translucent when printed thinly. The filament is also elastic but not as much a a regular rubber band… perhaps 5-8 times harder if I should make a guess. The material is not known to me, but I strongly suspect it to be polyurethane (PUR) with a surface coating/treatment to make it less sticky. Fennerdrives already produces PUR belting which have been used in 3D printing prior to this material appearing and due to the mat to glossy change. The filament isn’t exactly cheap I would say roughly 3x the cost of PLA/ABS including shipping compared to the cheap PLA/ABS I normally buy. Then again soft/specialty filaments doesn’t seem to come cheaply normally. Fennerdrives does ship both from the US and the UK, living in Denmark (inside the EU) this is a big plus for me. As I’m currently designing and building a tabletop CNC mill I thought that I might as well print some rubber feet for it. The print isn’t necessarily the simplest one to print due to the outwards sloping unsupported walls. However the angle is quite close to vertical and wouldn’t normally be causing problems. The 3D model was created using FreeCAD which is my preferred open source CAD package. 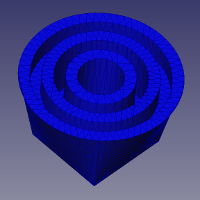 I used Slic3r for generating the G-code. And my printer is a RepRapPro Huxly which has a bowden extruder which might actually not be ideal for extruding a soft and springy filament. Was done using my regular PLA/ABS profile. I had to abort the very first attempt as the filament wasn’t printed continually. Much to my amazement the rubber foot actually printed sort of okay. It was however sticking so hard to the “Kapton” tape that removing it actually pulled the tape off the print bed! I then tried to create a specific profile for printing the rubber filament. Printed without having heat on the bare aluminium print bed. It printed with roughly the same quality at the first print but was very very easy to remove. I noticed that the hot end seemed quite “laggy” probably caused by the flexible nature of the filament and i therefore made some additional changes. “Skirt loops” was increased to 4, to give the hot end more time to build up a constant pressure. Just after starting the print I realized that setting infill to 0% would cause some parts to be printed in mid air with nothing supporting them from below. Out of curiosity I did however allow the print to continue. Also the surface finish was very satisfying. I’m pleased to report that the surface finish seems to be just as good as before. Please keep in mind that printer settings varies from printer to printer and that the one described here may not be optimal even for my own printer. Again while reading this keep in mind that I haven’t played very much with the temperatures. I had some undocumented failures after print 1 where the extruder/hot end seemed to jam and I haven’t dared reducing the temperature again as I needed/wanted some functional prints. The problems may however be related to too fast extrusions, filament loading and or the filament being deformed by the retracts. It has been confirmed by the friendly customer support at Fennerdrives that the material is actually polyurethane. Thanks for the info… useful guidelines. Can you please provide also the temperature you use in your septup with ABS/3mm filament? Even if the temperature and parameters are for each printer, for me is more usefull is you say “I print with 15ºC more (or less) than the normal ABS”, just to now if I need to start upwards or downwards…. Sure, I normally print my (1.75 mm) ABS around 210deg C, PLA in the range 170-190 depending on the area of the print (to compensate for cooling). Yes it definitely has more grip than plastic, especially the rough parts where it hasn’t been squashed flat and smooth against the print bed. I’m an engineer with Fenner Drives (we make NinjaFlex). I just wanted to add a few comments given that his review has been linked to by so many sources. First off, thanks for the thorough consideration of the product and the detail that you provide on printer settings. The comment “…my printer is a RepRapPro Huxly which has a bowden extruder which might actually not be ideal for extruding a soft and springy filament.” is key. I don’t have experience with bowden extruders, but given the concept, I was actually very surprised that you were able to get moderate quality prints with this setup. From all the testing we’ve done on flexible materials, the 2 key factors for getting high quality prints seem to be…fully supporting the filament b/w the drive gear exit and entrance to the cold end….and reducing the drag due to the tacky surface of flexible filaments. And maybe a close 3rd would be…high retraction settings to improve stop/start. None of these match up well with a Bowden. So…If you have access to a non-Bowden printer and are interested in making this a more comprehensive review, please give it a try. If you search on thingiverse for FD_Engineer, you can see some parts I posted that show typical print quality. Let me know if you want more info. I would actually consider the exterior of the last prints as good compared to what I normally produce. The interior is of course somewhat stringy as I don’t retract at all. I don’t know what if anything you do for surface treatment of the filament but it doesn’t feel that sticky, that combined with the non sticky nature of the teflon tube is probably what makes it possible to print using a bowden in the first place. Also the bowden tube actually supports the filament on the outside of the tube path as long it remains under pressure. As you write a non bowden based machine would be more ideal for printing with flexible filaments, unfortunately I don’t have access to such a machine. I’m glad to hear that the filament also works for you. It seems that your Airwolf XL printer has the extruder mounted directly on the X-carriage. As such do you have some additional comments with regard to print settings? FD_Engineer for instants is capable of retracting the filament and he does produce some excellent prints. ESPECIALLY when they aren’t written in English (or my native tongue Danish) . However as a google translate seems to reveal that you are a reseller of “NinjaFlex®”, and I know from there customer support that they are trying to reduce shipping costs I’m going to allow this comment, as some folks somewhere in Asia? might benefit from this link. FYI…at this time Fenner (NinjaFlex) has not set up any distributors/resellers in Asia. I’m using the same Boden type extruder on my Airwolf HD. I also found when printing small parts it’s best to print several and slow the travel speed way down. That allows the small features to freeze before you add more heat to it. Infill overlap 18% This helped eliminate the occasional gaps between beads. Thanks for the information, i was looking it for so long. I have one doubt on it, can u please guide me why the extrusion width 0.5 mm with a 0.5 mm nozzle ?? It just happens to be my default extrusion width after I tried to increase the level of details printable while trying to print a T2.5 pulley in PLA. Hi there, I’, with the airwolf HD and I have some issues Ninja jamming at the feed mechanism. Did you had this problem too ? I really want to get it going but after few layer of printing I always get a nut. I had some problems at first with the filament seeming to clog the nozzle. I use the old “stock” Merlin firmware that came with my kit, as a result it probably dos not have the best thermistor lookup tables available. It’s frustrating at times to use. Since we use the same tip with abs we found running it hot at abs temps works best. You will be surprised how long it takes to purge all the abs out. We also slow it down. Our print temp is 255c and print speed is around 20mm/sec. This temp will cause drool and stringing. After a part or two you can back the temp down 10-15c, once you are sure all the little bits of abs are gone. If you try and print too fast the filament will loop and jam in the drive before the feed tube on the airwolf hd. Yea the 27 mm/s would not work on my HD very long. Start around 15 and test slightly faster speeds. Also we found that you don’t need to cover the printer with this material. We enclose the HD printer when printing ABS, but if we do the same with the rubber material it becomes too warm and like cooked spaghetti. It dawned on me that the long purge times I see could be other flakes of abs picked up in the tube or from the drive mechanism. Mine creates a lot of flakes from normal slippage with the abs. Seems like we hit the maximum for nested replies so I will start a fresh one for Tim. When I first commissioned my Huxley some years ago I had some problems getting it to print PLA fast (faster than perhaps 15mm/s). and it would seem that the extruder would happily cope with faster extrusions. Back then the extruder made quite a lot of dust/flakes. I could also hear the extruder making different noises at higher speeds where it lost its grip on the filament. Any way I only have very little dust/flakes coming from the extruder mechanism, and my bowden tube also looks clean. I am wondering if your Airwolf HD would also benefit from a tighter grip on the regular filament. bed temp: works between 40 – 60. sticks well, comes off easily. Having exactly the same problems if I extrude too fast. The filament loops out. It’s a wonderful material, hopefully fennar makes it with a rigid shell. Hope this helps with what’s possible. Prussia/Mendal. – Bowden 0.4 mm nozzle w/ 3mm filament. I am using 10mm/min speeds. 20mm/min retract speed, retracting 1mm. Extra temp 225. Bed temp around 60 depending on ambienthe room temp. Rectilinear Infill > 40% for smooth top layer. Yes @ 10mm/min it takes a long time, but results are good and repeatable. Ive been following this for a little while now… I have a rostock max v2 so I wasnt overly confident about printing soft filaments. A couple things i did that helped my odds were to replace the feeder with a airtripper feeder. Reason being it has a variable tension method so I can get it perfectly dialed in to the filament. After getting it all dialed in, I successfully printed an iphone 6 case with grass colored ninjaflex. Couldnt be happier… it is VERY possible on bowden style printers, but it isnt easy. Hi, my printer has two settings, ABS @ ~265°C and PLA @ ~210°C. Unless I install temp mod I can not change temp. The specs of ninja flex say extrude between 210-245°C. Will 210°C be enough? But out of curiosity what printer and which controller does it use? Not being able to set the temperature freely seems very odd indeed! I am carrying out a project regarding 3d printing and testing of ninjaflex at university and was wondering if you had any experience with using this material in a flashforge dreamer? And what settings may be appropriate? Also if you have any additional information that might be helpful for my project regarding material properties that would be great. Excellent post. Thanks for the great info. I too am having the problem with NinjaFlex jamming and looping out of the feeder on my Ultimaker 2. Going to try some of these setting but am all ears if anyone else has any suggestions. Yes! I noticed my temp was set to 225 and i upped it to your recommendation of 240. Since then the filament has not jammed up in the printer and has been printing over an hour. The most i would get was about 20 mins before jamming. This post helped tremendously!! I am now a loyal follower. Thanks so MUCH. Hi, just a note on temperature. the MSDS list unfavorable decomposition beyond 220 degrees C. Hydrogen cyanide specifically. Vent your units if you choose the higher range. I ha excellent results at 210, and a slow 4mm/s. Spent 30 minutes removing from bed (50 degrees). It might also be worth noting that PUR is far from the only polymer to decompose into nasty chemical compounds like CO and HCN which in generally makes it a good idea to ventilate the printing area. While 4mm/s @ 210 degC seems awfully slow I’m still curious, was this with a bowden based extruder or a direct drive extruder? After all the lower temperature probably reduces oozing and might also be beneficial for bridging. Hi. The process was painful to watch. The print came out good, but getting it off was a challenge. Now sure the differing names for extruders, but mine is from Ecksbot and has a gear driven hobbed shaft. The MSDS I referred to was from the Ninja site, for black material. I will try a faster feed rate, but am more interested in fixing the project removal problem. I think no heat on first layer then go to 50 degrees C to help with the bonding. The Ecksbot seems to have the extrude motor mounted on the x-carriage, unlike bowden extruders where the heavy motor/extruder is located way from the hot end feeding the filament to the hot end through a bowden tube. This page: http://reprap.org/wiki/Erik%27s_Bowden_Extruder contains a more detailed description. Or perhaps not bed heat at all? I have a really complex shape to print with SEMI-flex and it really needs Supports … have you had any experience of using Supports with NINJA-flex yet?.. I’m using Simplify3D on FF pro’s, Thank you. Unfortunately I don’t have any experience printing flexible materials with support. I am using Replicator 2X. When I load filament ABS it comes out smooth. When loading Semiflex – it doesn’t come out consistently and also it comes out very thin. when loading Ninjaflex – Doesn’t come out at all. But have you tried to reduce the print speed? Ninjaflex is quite soft, and if you try to force it through the extruder too fast you might end up digging a hole in the filament with your extruder. I did not even get that far where i can set the temperatures and speed. Using this modification will enable you to print flexible filaments with the ultimaker 2: https://www.youmagine.com/designs/ultimaker-2-straight-tube-flexible-filament-spool-holder. Change the foot of the tower to your own needs to use this mod with other printers. 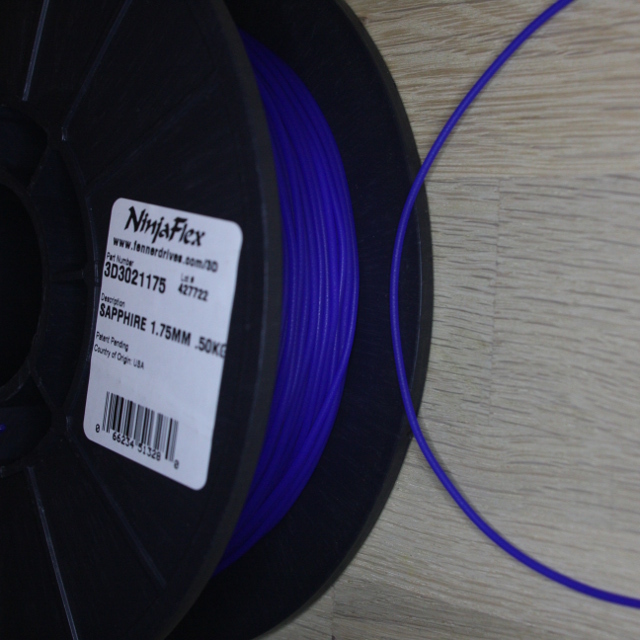 Ninjaflex filament is one of the best filaments we can use for 3D Printers. Overall very nice post on 3D printers and filaments. Thanks for sharing this with us. Thanks for the great info! My semiflex parts are looking better already. Thank you! Tried your settings on a Geeetech Prusa i3 and it prints pretty good! Only change is that I use 0.1 mm layers, I forgot to change, but it looks good. I am using PrimaValue Flexible from 3D Prima, a Swedish supplier.